The 360-foot sternwheeler cruise ship, Empress of the North, owned an operated by Majestic America Line of Seattle, WA, arrived over the weekend at Vigor Industrial's shipyard in Portland, Oregon. Repair work in Oregon for the vessel will be performed by Vigor Marine - a Vigor Industrial company with state-of-the-art equipment and experienced personnel, is capable of handling ships of virtually any size. The Empress of the North made headlines a month ago after running aground May 14th in Alaska, 49 miles west of Juneau, Alaska near Hanus Reef in Lynn Canal. Local fishing boats, a Coast Guard cutter, and the state ferry Columbia coordinated efforts to evacuate 252 passengers and crewmembers from the Empress of the North to Juneau where they were assisted further by a Unified Command team. Empress of the North at the Alaska Ship and Dry Dock facility in Ketchikan in May. 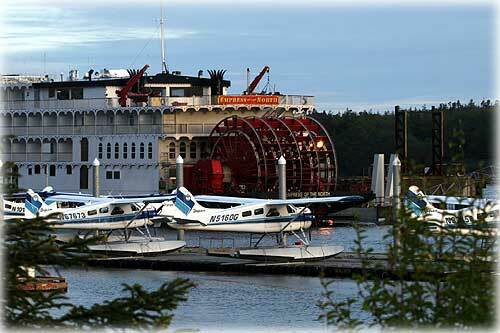 (Dry Dock in background - Taquan float planes are in the foreground.). The sternwheeler left Juneau on May 20th accompanied by two tugboats on her way to Ketchikan for inspection at the Alaska Ship and Dry Dock facility to determine if the Empress of the North needed to travel further south to complete repairs. At that time, Vigor Marine sent mobile crews north to Ketchikan to make the immediate repairs necessary to stabilize the vessel for travel to the shipyard. Roughly twenty craftsworkers and supervisory staff traveled to the Ketchikan from Vigor Marine for a seven day repair period. In addition to the temporary steelwork, the team accomplished approximately nine tons of permanent repairs to the fuel tanks. "We have done work on the Empress of the North in the past, so know the vessel pretty well," stated Rene Doiron, Vice President of Vigor Industrial, "Our skilled labor resources made it easy for us to help out and we look forward to a timely completion of the job here in Portland. Majestic America Line is a great customer to work with and we anticipate that the project will go smoothly." The vessel arrived Saturday evening, June 9th, at Vigor Industrial's facility in Portland, and was drydocked without incident according to a Vigor Industrial's news release. Permanent repair work started with the day shift Sunday, and is well underway.